The global hemophilia treatment drugs market was valued at US$ 9,500 Mn in 2017 and is anticipated to reach US$ 15,000 Mn by 2026, expanding at a CAGR of 5% from 2018 to 2026. Increase in R&D investment by key players for developing new drugs for the treatment of hemophilia and rise in demand for long-acting replacement therapies and non-factor therapies are anticipated to fuel the growth of the global market during the forecast period. North America dominated the global market in 2017 owing to the introduction and uptake of new long-acting factors and alternative coagulation promoters and increase in the rate of diagnosis for hemophilia. The global hemophilia treatment drugs market is driven by government initiatives such as nationwide network of hemophilia treatment centers (HTCs) funded by the Federal Government in the U.S. Many of the HTCs are located at major university medical and research centers. The Federal Government in the U.S. provides funds for more than 100 HTCs. Treatment, education, and support are provided by medical experts at these HTCs. Patients who are provided care and treated at HTCs are less likely to have hospitalization and bleeding complications than those who avail care elsewhere. The global hemophilia treatment drugs market has been segmented based on product type, disease indication, distribution channel, and region. In terms of product type, the recombinant coagulation factor concentrates segment is projected to account for significant share of the market during the forecast period. New recombinant pipeline agents and gene therapies, such as Fitusiran (phase III trials) and valoctocogene roxaparvovec (phase III candidate), are expected to gain market share during the forecast period. However, some products such as CSL-689 (phase II/III for hemophilia A and hemophilia B) are likely to account for small market share, as these are positioned as on-demand treatments in a market that is increasingly moving toward prophylaxis. In terms of disease, the global hemophilia treatment drugs market has been classified into hemophilia A, hemophilia B, and others. The hemophilia A segment accounted for major share of the global hemophilia treatment drugs market in 2017. According to the Centers for Disease Control and Prevention (CDC), the exact number of people living with hemophilia globally is not known; however, hemophilia A affects 1 in 5,000 male births. About 400 babies are born with hemophilia A each year. In terms of distribution channel, the global hemophilia treatment drugs market has been categorized into hospital pharmacies, retail pharmacies, and online pharmacies. The hospital pharmacies segment held major market share in 2017. The segment is likely to account for leading share of the market during the forecast period. In terms of region, the global hemophilia treatment drugs market has been segmented into North America, Europe, Asia Pacific, Latin America, and Middle East & Africa. North America and Europe accounted for major shares of the global hemophilia treatment drugs market in 2017 and the trend is likely to continue from 2018 to 2026. High rate of immigration from tropical regions, increase in health care budgets by governments, and government initiatives to promote hemophilia treatment contributed to the leading shares of these regions. Asia Pacific is projected to be the most attractive market for hemophilia treatment drugs during the forecast period. The market in Asia Pacific is expected to expand at a high CAGR from 2018 to 2026 due to large number of hemophilia patients opting for recombinant coagulation factor concentrates in developing countries such as India and China. The market in Latin America is poised to expand at a moderate growth rate during the forecast period. Prominent players operating in the global hemophilia treatment drugs market include Pfizer, Inc., CSL Behring, Kedrion, Shire plc, Novo Nordisk A/S, Bayer AG, F. Hoffmann-La Roche Ltd., and Sanofi. Shire plc accounted for the largest market share in 2017. The company’s dominance of the market is due to its broad product portfolio, extensive geographical presence, and aggressive acquisition strategies. Shire plc strengthened its market position by acquiring Baxalta in June 2016. Baxalta is a key player in the rare diseases and other specialized disorders segments. Novo Nordisk A/S accounted for the second largest share of the global hemophilia treatment drugs market in 2017 due to wide range of hemophilia drugs and robust pipeline. However, F. Hoffmann-La Roche, a new entrant in the hemophilia treatment drugs market, is expected to outperform Novo Nordisk during the forecast period. Pfizer held the third largest share of the hemophilia treatment drugs market in 2017. Hemophilia treatment drugs are products that are administered into the patient’s body in order to replace the blood clotting factors that are missing in their blood so that the blood can clot properly. This report analyzes the current and future prospects of the hemophilia treatment drugs market based on product type, disease indication, distribution channel, and region. The research is a combination of primary and secondary research, conducted for understanding and arriving at trends, used to forecast the expected revenue of hemophilia treatment drugs market in the near future. Primary research formed the bulk of our research efforts with information collected from in-depth interviews and discussions with a number of key industry experts and opinion leaders. Secondary research involved study of company websites, annual reports, press releases, investor presentations, analyst presentation and various international and national databases. The report provides estimated market value in terms of US$ Mn for product type, disease indication, distribution channel, and region for the period 2018 to 2026. The market report comprises an elaborated executive summary, which includes market snapshot that provides information about various segments of the market. It also provides information and data analysis of the market with respect to market segments based on product type, disease indication, distribution channel, and region. 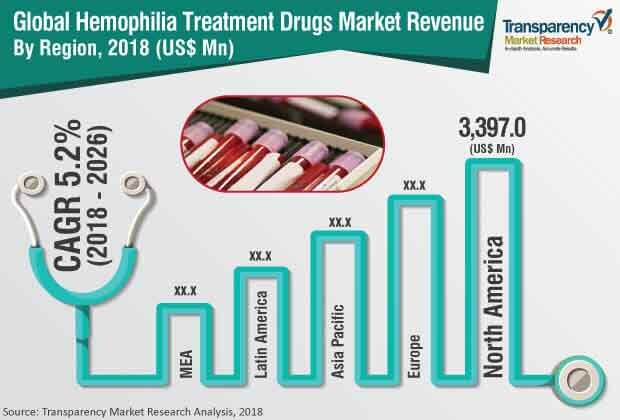 The market overview section of the report analyzes market dynamics such as drivers, restraints and opportunities that influences the hemophilia treatment drugs market in the current and future scenario. The report also provides Porter’s five force analysis that studies five factors and their impact on the hemophilia treatment drugs market. Market share analysis among the market players is analyzed to signify the contribution of these players in the market in terms of percentage share. All these factors would help the market players to decide about the business strategies and plans to strengthen their positions in the global market. Based on region, the market has been analyzed for major regions: North America, Europe, Latin America, Asia Pacific, and Middle East & Africa. The study also covers detailed country analysis in the respective regions for the hemophilia treatment drugs market. The report also profiles the major players in the market and provides various attributes such as company overview, financial overview, product portfolio, business strategies, and recent developments. Major companies profiled in the hemophilia treatment drugs market include Pfizer, Inc., CSL Behring, Kedrion, Shire Plc., Novo Nordisk A/S, Bayer AG, F. Hoffmann-La Roche Ltd., and Sanofi. Strategic collaboration agreements and new product development was the primary strategy adopted by major market players to bolster their position in the hemophilia treatment drugs market.